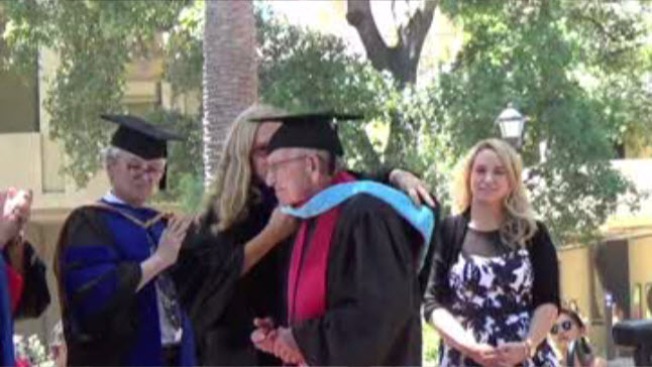 A World War II veteran walked across the stage at Stanford’s graduation ceremony on Sunday, more than 60 years after receiving his degree. With his granddaughter by his side, Bonnie "Chuck" Gould, recipient of the bronze Medal for Bravery during his WWII service, finally got the sash and the public recognition he earned decades ago. Gould, a retired teacher, coach, principal and superintendent of the Redwood City School District, graduated from Stanford with a master’s in education in 1954. But he didn’t walk in the ceremony. He called it a mistake, but not one made intentionally. “We had six kids and I was teaching school and I had otherwise planned my day and I didn’t go,” Gould said before the ceremony. When his granddaughter, Crystal Sturgis, called Stanford and asked if her 93-year-old grandfather could walk in this year’s ceremony, the family was thrilled when the answer was ‘Yes.’ He was surrounded by his 10 grandchildren and 13 great-grandchildren, who attended the ceremony, the Chronicle reported.